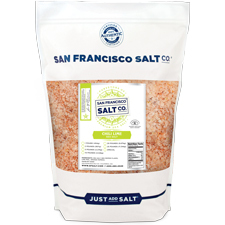 Sriracha Salt - 5lb Bag | San Francisco Salt Co.
We created Sriracha Sea Salt to satisfy the cravings of spice connoisseurs. 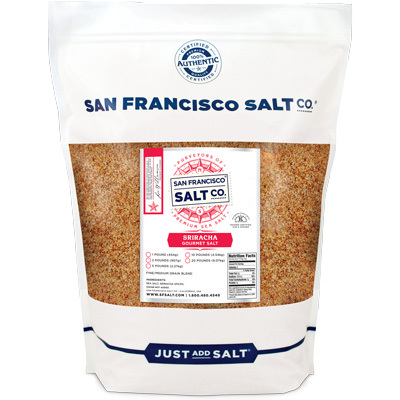 The perfect finishing salt, this salt promises to fire up your taste buds! 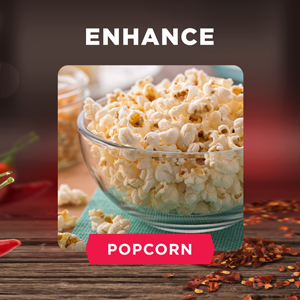 To recreate the iconic Sriracha flavor in salt form we infuse Pacific Ocean Sea Salt with Authentic New Mexican Chimayo Peppers, Habanero Peppers, and Garlic Powder! Be careful, or the heat will catch up to you! 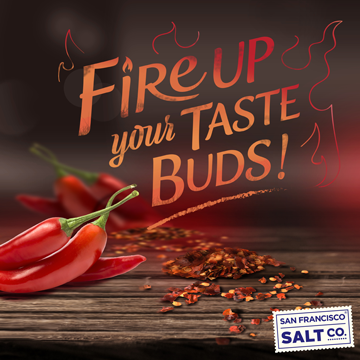 POWERFUL, SPICY FLAVOR - This unique salt combines the sweet-spicy flavor of Chimayo Peppers, the powerful heat of Habanero Peppers, and the savoriness of Garlic to create the ultimate picante salt that is sure to leave you wanting more! 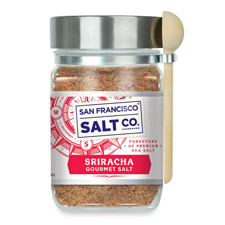 AWAKEN YOUR TASTE BUDS - Our Sriracha Gourmet Salt perfectly complements guacamole, huevos rancheros, salsa, grilled corn on the cob, instant ramen, chicken, ground beef, and more. Use this salt on the rim of Margaritas and in Bloody Marys to add a unique spicy kick! 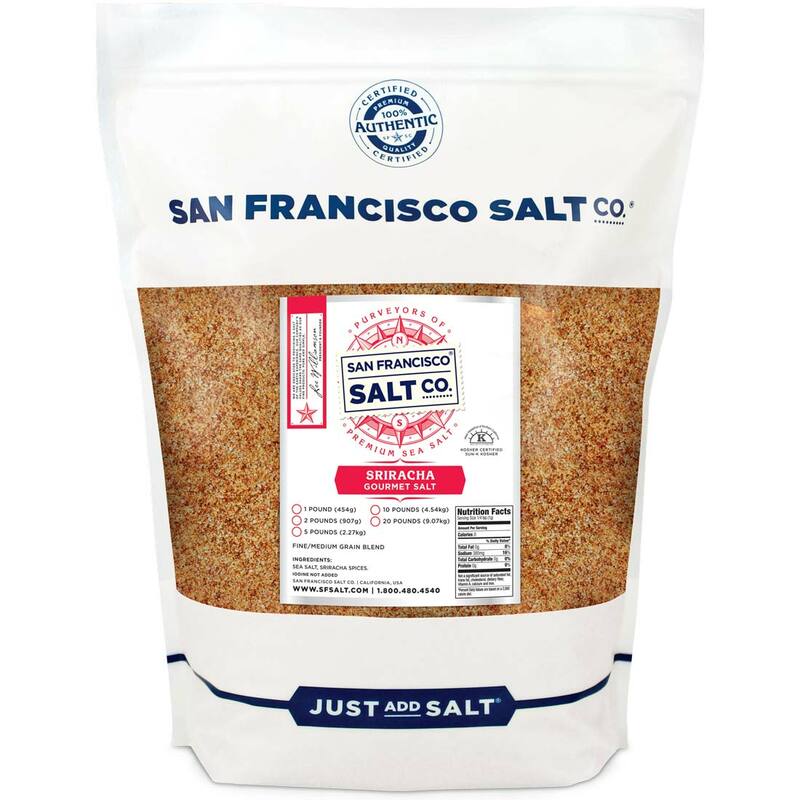 BUY WITH CONFIDENCE - The San Francisco Salt Company is confident that you will be happy with the quality of our products and stand behind every single item. San Francisco Salt Company has been a trusted supplier of salt since 2002. DESCRIPTION - Pacific Ocean Sea Salt infused with Chimayo Peppers, Habanero Peppers, and Garlic. We package in our U.S.A., SQF Quality code compliant facility. PACKAGING - 5 lb. Resealable Bulk Bag. 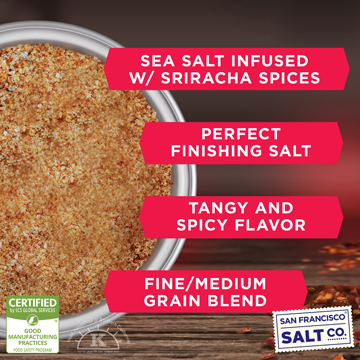 PROPERTIES - Our Sriracha Gourmet Sea Salt is Kosher Certified and does not contain any MSG, Soy, Gluten, Dairy, anti-caking agents, artificial ingredients, or additives. 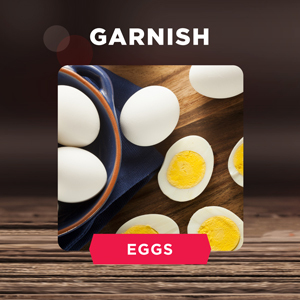 INGREDIENTS - Sea Salt and Sriracha Spices (Proprietary blend of Chimayo Pepper, Habanero Pepper, Garlic, and Citric Acid for flavor). 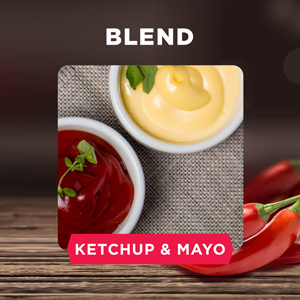 Enhance everyday condiments like ketchup, mayo, & mustard with a dash of Sriracha Gourmet Salt to create unique, fiery sauces!